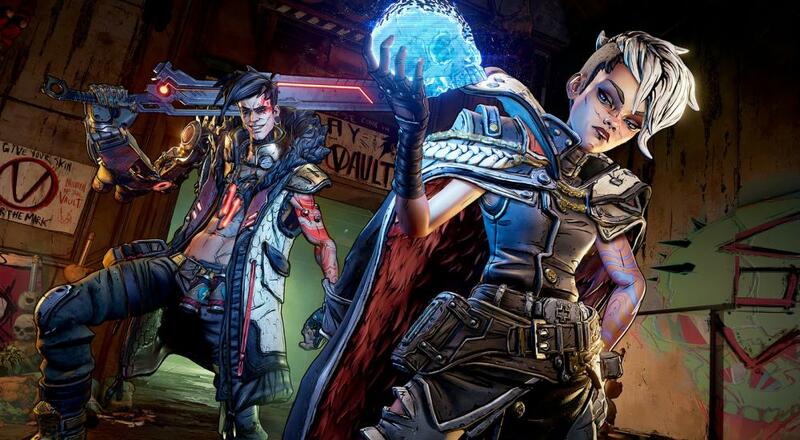 Along with the release date announcement, Gearbox also pulled back the curtain some on the co-op features. Specifically, player counts. Two player couch co-op and four player online co-op (along with a mix-and-match of the two, i.e., "combo co-op") is confirmed for the consoles, while the PC version will be four player online co-op only. You can join a friend's game regardless of character and story progression on either end and loot will be instanced per player. What's more, that loot will be level appropriate for that player. For example, let's say you blazed through everything and are at max level and join your friend who is still starting out. Your guns will be at your level and your friend's guns will be at theirs. What's more, you won't be steamrolling everything by being a higher level. Sounds like Gearbox will be normalizing enemies/damage to each player's level. Moze is a nimble soldier who can digistruct and hop into her mech—Iron Bear—anytime she needs some additional firepower. Amara is a Siren who can summon ethereal fists to pound enemies. Zane is a semi-retired hitman who can cause chaos with his Digi-clone and other gadgets. And FL4K is a wandering robot who’s always accompanied by one of their loyal and battle-hardened pets. The next date to mark on your calendars for now is May 1. That's when an extended gameplay video will drop and even more info will be shared. Until then, just enjoy the thought of getting a gun that shoots "fire-spewing volcanoes," because that apparently is a reality now. Page created in 1.1232 seconds.